Several days ago, I mentioned memories of my time in Paris with Gwen. This story, unlike the one on Monday, is in the book Thirteen Months. Gwen was friendly, encouraging, challenging, and confident. This story reveals all of those qualities. I hope you enjoy it. Late one evening, Gwen decided she was ready to go to the top of the Eiffel Tower. It was breezy and cool, but we were prepared. Gwen has never been a fan of heights, but she wanted to go for me, and she was looking forward to seeing Paris from high atop the city. We had been told that the view from the pinnacle was best at night. Notre Dame Cathedral, the boats on the River Seine as it winds romantically through the city, the Arch de Triumph, and Sacré Coeur glowing in the distance lit up the sky with a brilliant glow, revealing the magnificence of the city. Gwen was quite apprehensive but determined to go. A little nervousness had set in as we were waiting for the elevator, but she just held my arm and smiled. Gwen laughed … loud! Mr. Burly looked over at her in amazement. Then, as if it couldn’t get worse, it did. As she continued to hold my arm tightly, she yelled over to him, “You have got to be kidding!” What did she say? What? He started to walk toward us, and as he drew closer I was relieved to see that, based solely upon his physique and muscle structure, the first blow would kill me—there would be no need to suffer. No use; off she went again. “I hate heights, I absolutely hate them! 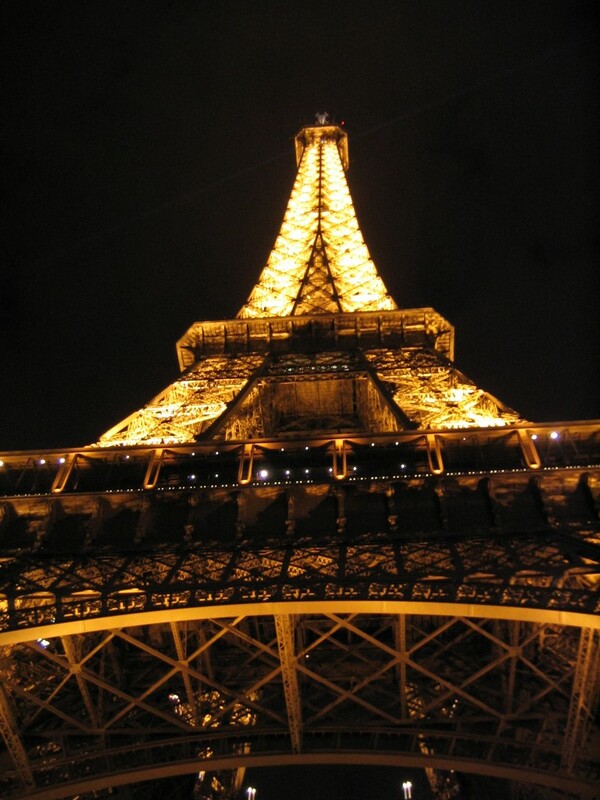 But I’m in Paris, and I’m going to the top of the Eiffel Tower … tonight! I am going to see the city lights and walk all the way around up there.” She stood and grinned at Mr. Burly as he stopped and stared at her. I suddenly realized—he didn’t even see me. His gaze was fixed upon Gwen alone. “Are you serious, lady? You don’t understand. That really freaks me out!” He pointed to the top again. “So what? Just do it. I’m going,” she stated mater-of-factly. She smiled a determined smile as he looked yet again at the looming masterpiece of architecture, shaking his head. When the elevator came, we boarded alone. After a short ride, the doors opened at the top and we both gasped—the view was breathtaking! The city glowed with millions of lights in every direction, illuminating some of the world’s most magnificent structures. Gwen grabbed my arm and pulled herself against me. “This is beautiful, Don. Thank you for bringing me here.” She looked up and gave me a sweet kiss. As we admired the view, the elevator doors opened and out stepped the burly guy with his friend. He walked cautiously to the edge of the platform, placed his hand on the railing, and was immediately spellbound. “Oh … my … gosh! Dude, do you see this? This is so cool!” [His voice boomed like a burly guy’s should.] “Look man—you can see the Arch, right over there!” He pointed like a kid seeing his first bike. He wandered around the platform in awe of the view he almost missed. We stood at the railing for quite some time as we were swept away by the magic and romance of the city. Paris was made for us, for our love. We looked at the river far below, and the night was enchanting as she snuggled close. After a bit, the coolness of the evening drew us back to the elevators. “Hey, lady!” The big guy stood by the railing with his hands in his jacket pockets. Gwen gave him a huge smile. She giggled at him. “I knew you could do it!” She waved to him as the elevator departed. He still had no idea she was with anyone.